This is a 2 session class happening on 2 consecutive Sundays from 4-7 PM. 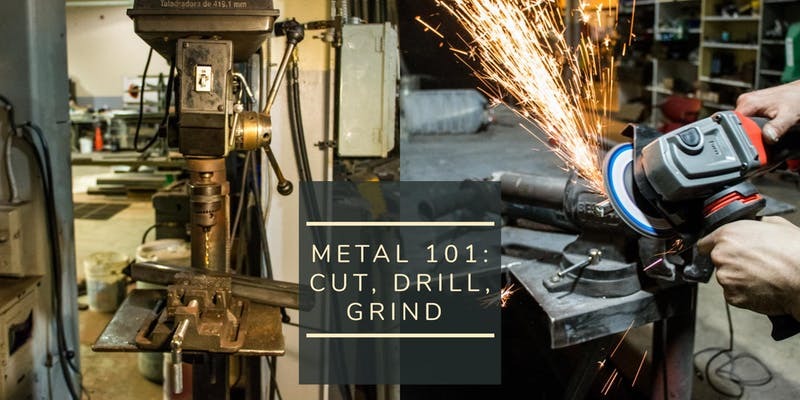 Metal 101 is a great baseline for general shop use and a prerequisite for welding, we'll discuss material selection and identification, how to choose the right tools to cut and shape it, and safely and effectively finish parts. Along the way, we'll touch on keystone concepts of machine tools and their operation. This is a two session class, comprised of 3-hour segments, the first being explanatory as well as hands-on, and the second to demonstrably put the skills to practical use and answer follow up questions. Formal training from the instructor who will demonstrate safe and successful usage of each tool, describe and demonstrate best practices, and inform the class of unsafe/undesirable outcomes. "Ferrous vs nonferrous cutting tools"
"Watch out for rotating bits"
"What is a pinch point and how can it maim me?" Each student will have hands-on time with each tool under supervision. Students have the option to stay later in order to participate in peer review. Learn how to pick the right saw for the job, how to drill holes, and how to grind the burrs down. A quick introduction to the staples of metalworking and the perfect warm-up to welding. - How do I grind this? There are no prerequisite classes for METAL 101 as this is the place to start!